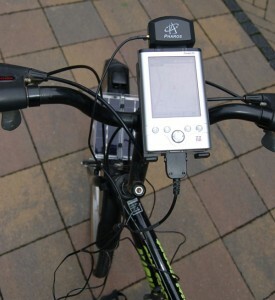 The Solar-Powered Bicycle GPS gadget is the creation of Brian Nadel, who wanted to be able to get home when he’d gotten lost whilst out cycling! Made from old computer parts in his office, Brian’s gadget cost him virtually nothing. Brian estimates you could build a similar unit using items from eBay and discount stores for around $150. The GPS gadget is made up from an old Pocket PC, a 128MB SD flash memory card, Pharos iGPS-CF GPS receiver with Ostia mapping software, a solar pocket charger which delivers 2W of power at 4V to 7V depending on the weather, velcro, cable ties and a desktop PC for programming. You can see the full article on MAKE: Magazine. A great example of innovation, recycling and being eco-friendly!